A quick trip to Southland involved going to Tuatapere and then heading west…. 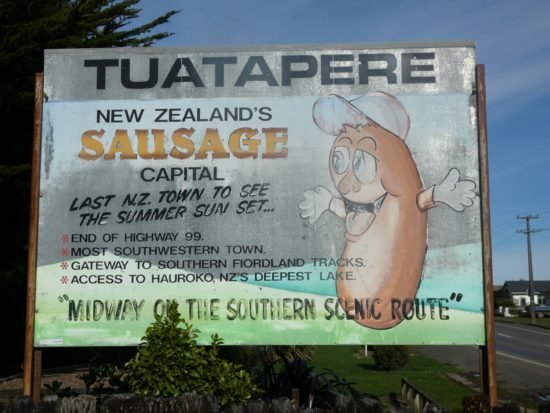 This large, jaded sign welcomes you as you drive into Tuatapere New Zealand’s Sausage Capital. This tired sign harks back to the days of the Tuatapere’s famous sausage shop. In 2015 I wrote about its demise. Tuatapere is well worth a visit. We continued to head west, the rental car was not really designed to handle the uneven, rough gravel forestry roads, however all was good. We ended the day in Bluff, having Bluff oysters and chips by the sea, looking out to Foveaux Strait – Te Ara a Kiwa.